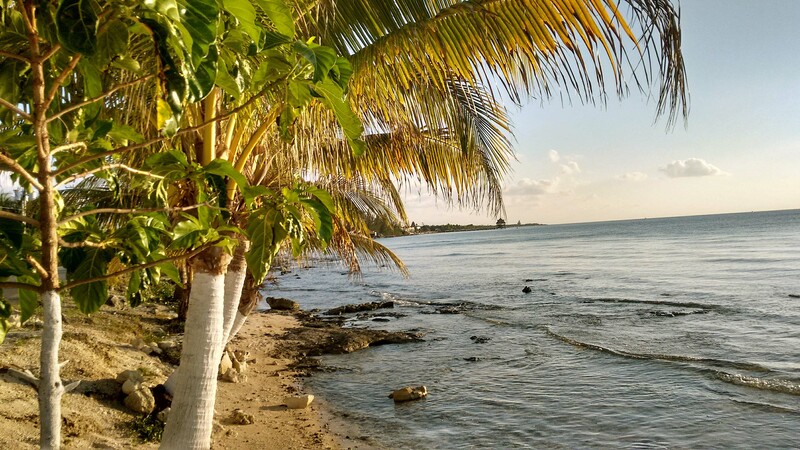 Over the past 18 months of travel, (and 15 years prior to our embarking on this adventure…) Marcus expressed regularly that when we traveled, he wanted to find a place right across from the water where he could go snorkeling right from the beach. 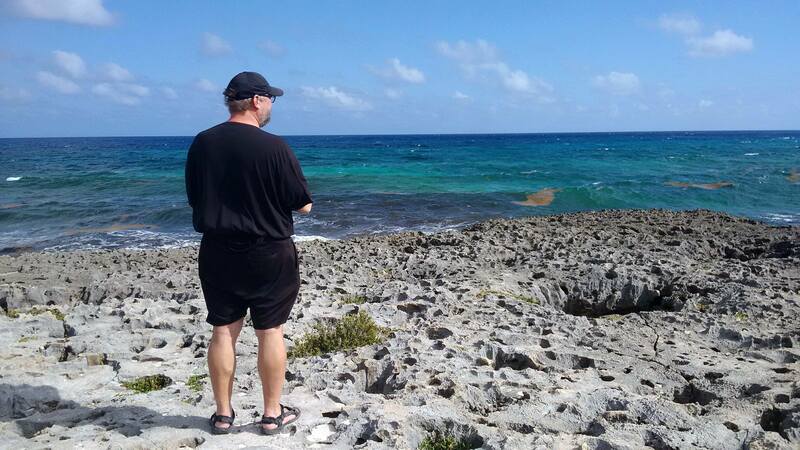 You would think that this would be a relatively easy thing to achieve, but it has eluded us… up until our trip to Cozumel. For a weekend, we were able to experience this. 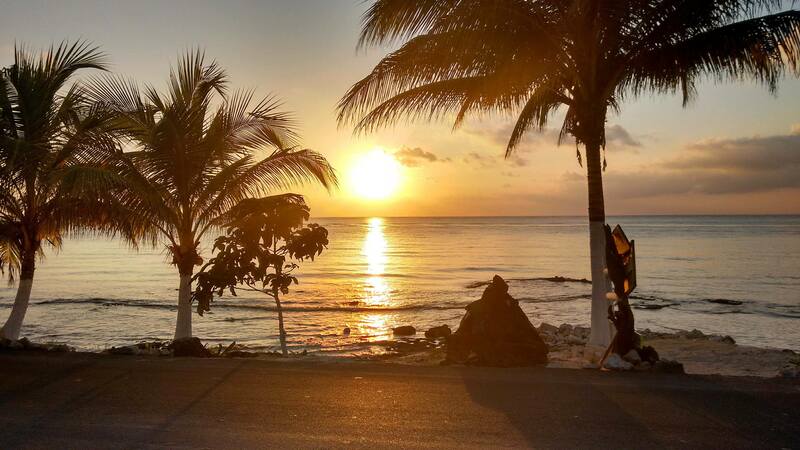 Cozumel is an island that is a 45 minute – 1-hour ferry ride away from Playa del Carmen. Most people take the passenger ferry from downtown. Up until recently, taking a car over was quite an expensive option (like – several hundred dollars to take a car our size over). However, a week before our trip a new car/cargo ferry started running which allowed us to make the round trip for about $60 CDN. 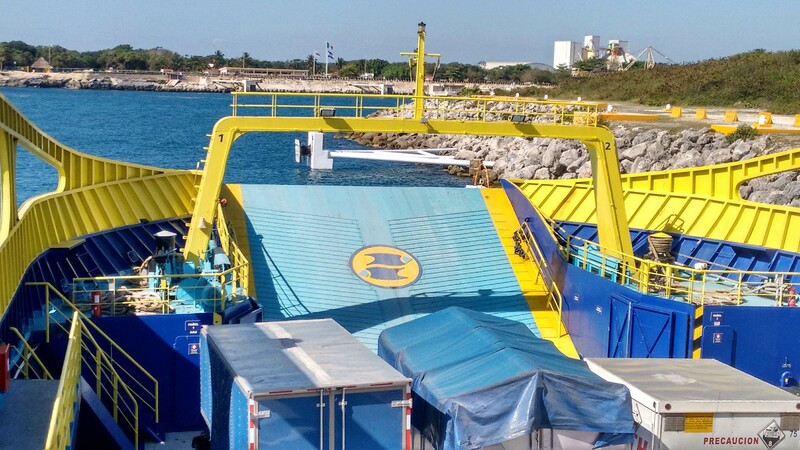 The car/cargo ferry’s run from a dock that is a bit south of town (about a 5-minute drive from our place in Playa del Carmen). There are only a few ferry’s that run throughout the day, and you need to be at the dock a good hour in advance to line up for the ride. The ferry ride itself though is part of the adventure. 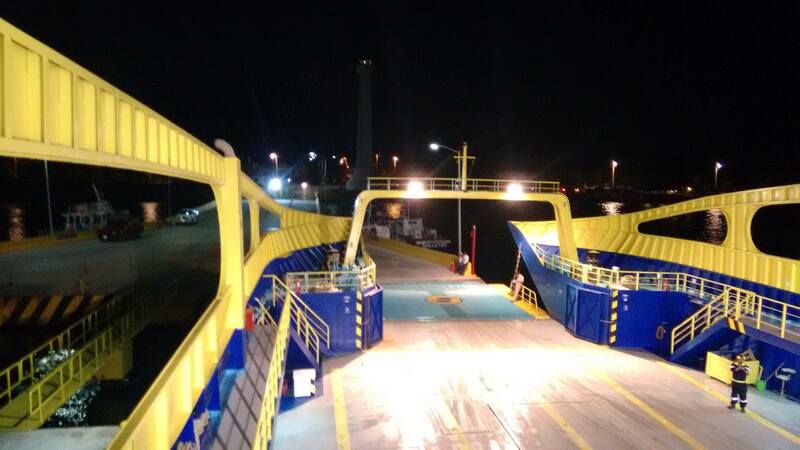 After your car is in position, you can climb up the stairs to a passenger deck with comfortable benches and a cafeteria inside – or places outside where you can enjoy the ride and breezes. 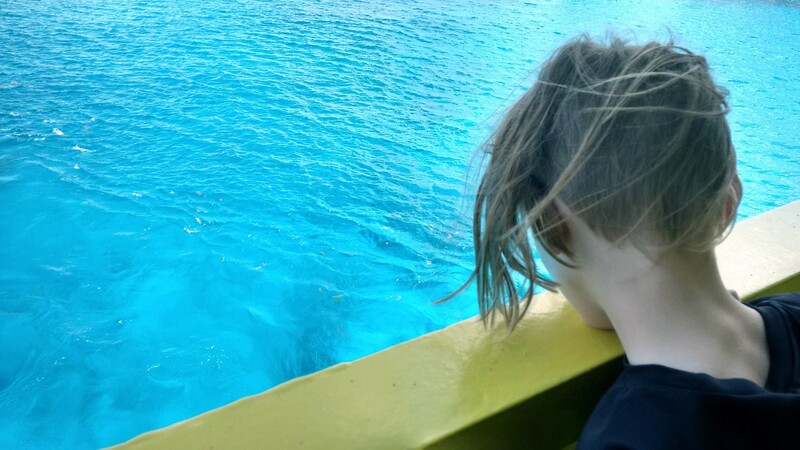 There are two things that struck us when we approached the dock in Cozumel – the number of large cruise ships docked nearby – and the colour of the water. It was stunning. We had a bit of time before our rental was ready, so we headed into town to have lunch at a place called the “Lobster Shack”. Everything that we tried there was tasty – and they took Morgan’s gluten allergy seriously (which is something I always appreciate). 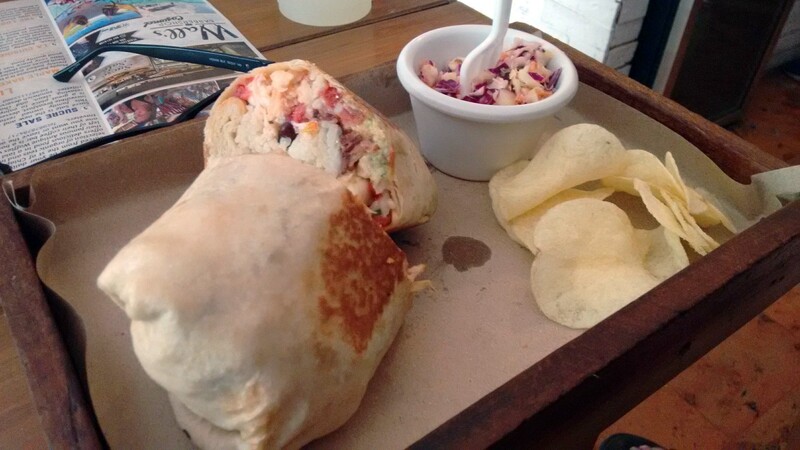 Marcus’s Lobster and Bacon burrito was particularly amazing. Then we drove along the water, to our weekend rental – which was just down the road from the Chankanaab beach. We could see the reef from our balcony. Marcus finally got his wish of staying at a place where he could snorkel right off the beach. And… as you can imagine, our weekend consisted of several snorkel sessions with eating sessions in between. The view of the sunsets that we had during our stay was amazing. 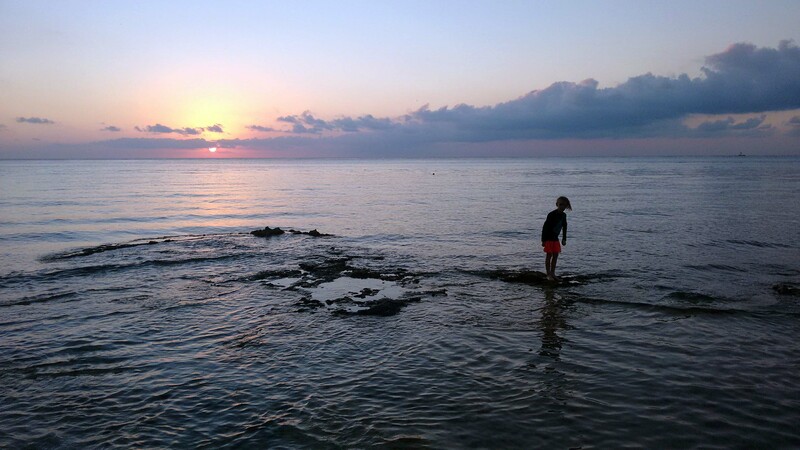 This area claims to have the most beautiful sunsets in the world. I’m not sure that I agree with that claim, but they were beautiful. And, the sea life that comes close to the beach is spectacular too. Artie is standing out on the reef here – watching two fins as they bob in and out of the water. We have no idea what those fins were attached to (tiny dolphins – or tiny sharks). 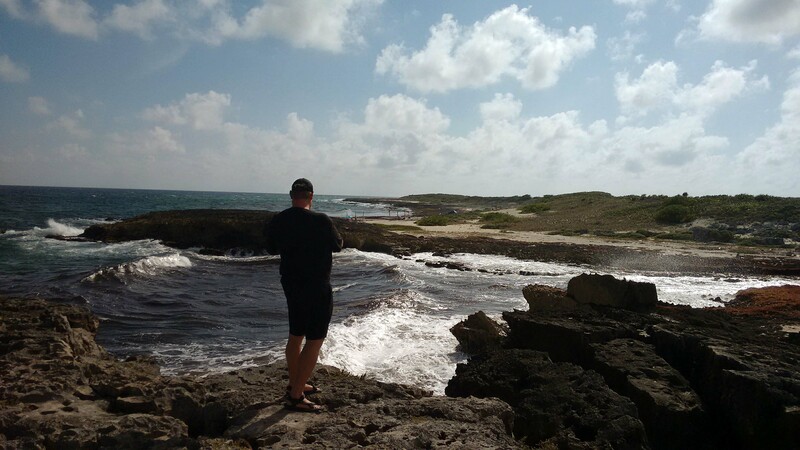 On our last day on the island, before we headed to the ferry to go back to Playa del Carmen we drove around the entire island. The southern tip of the island, and the eastern side are pretty much uninhabited. The views from the southern tip are beautiful though – but not as gentle as they are on the western side. 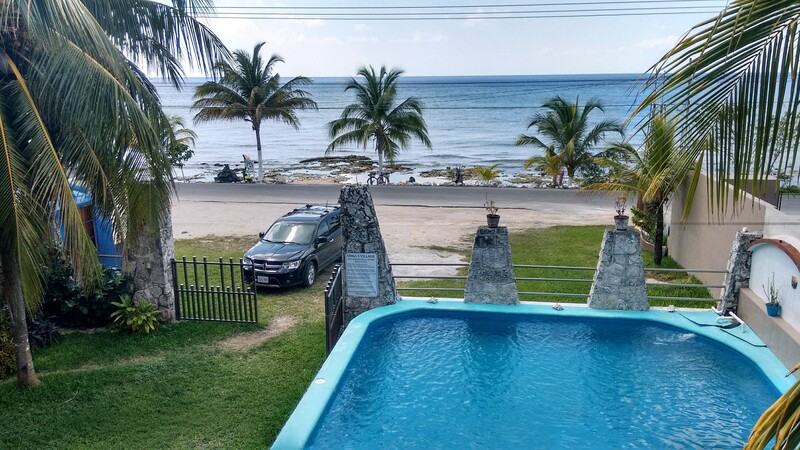 We crossed back over to Playa del Carmen on an evening ferry – tired – but very satisfied with our lovely weekend in Cozumel.